Inspirational Malala Yousafzai will attend the United Nations General Assembly this Friday, 12 July, to deliver a groundbreaking speech on education. The Pakistani schoolgirl, who was brutally shot in the head by the Taliban in November 2012, will also present a petition to the Secretary-General Ban Ki-moon, on what will be her 16th birthday. In what is being described as the first UN youth takeover, the teen, along with 650 other youngsters, will urge the world’s governments to help to enrol children at school. Malala has worked tirelessly to campaign for girls’ education since leaving hospital and hopes to help the 57 million children who still don’t have access to education. 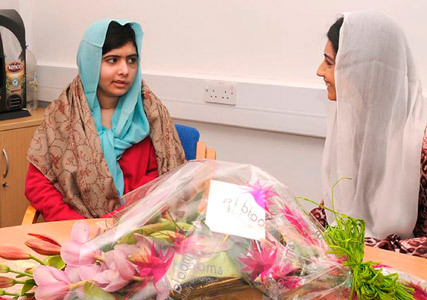 In a statement, she said: ‘On 15 June, fourteen girls were murdered in Pakistan simply because they wanted an education. Many people know my story but there are stories every day of children fighting for an education. ‘The basic right to education is under attack around the world. We need change now and I need your help to achieve it. You can help me and girls and boys across the world. We are asking the United Nations General Assembly to fund new teachers, schools, books and recommit to getting every girl and boy in school by December 2015. ‘This July 12th is my 16th birthday and I am personally delivering this petition to the United Nations Secretary General Ban Ki-moon. I became a victim of terrorism after I spoke out in favour of education of girls. These innocent girls killed in Pakistan have nothing to do with politics and only wanted to empower themselves through education. The petition has already received 236,688 online signatures and that figure is climbing rapidly. You can sign it for yourself here. 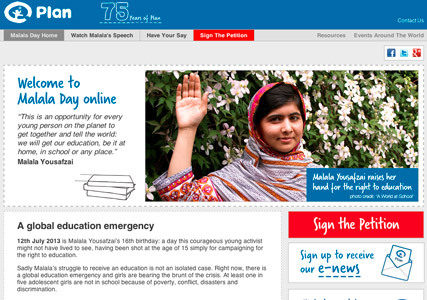 Good luck, Malala. We’re right behind you.